FC Barcelona took a point away from the Benito Villamarín on Sunday in a fiercely disputed match. It was not the result the Catalans were after, but Luis Suárez’s late equaliser at least meant the visitors did not leave empty handed. The goal puts the Uruguayan at the top of the league’s scoring charts with 16 goals, one more than teammate Leo Messi and four more than Cristiano Ronaldo (12). - When Suárez scores, Barça do not lose. The striker has scored in 67 matches out of the 125 he has featured in for Barça with a record of 63 wins and four draws. 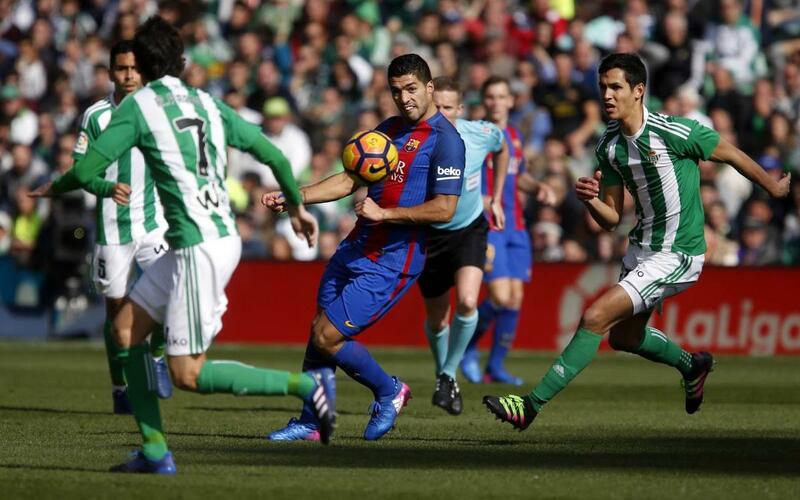 - Betis become Suárez’s joint-favourite opponent along with Sporting with seven goals. - Messi served Suárez with a perfect assist to rescue a point at the end – is was the Argentine’s fourth assist of the league season. - Arda Turan reached his 50th appearance in a Barça shirt. The Turkish international has a record of 37 wins, seven draws and six defeats. He has managed 15 goals in total, 13 of which have come this season. - Mathieu played the most successful passes out of anyone on the pitch (55). - Ter Stegen had another busy day in goal, with the German making six saves to reduce Betis to just one goal.